Hyundai and Kia Motors are going to apply ‘connectivity’ function to all new cars that will be released after 2018. They are also going to work with domestic and foreign companies and apply ‘voice recognition AI (Artificial Intelligence) assistants’ that are able to recognize natural language to their new cars starting from 2019. Their plan is to have entirety of their cars as connected cars by 2025. According to high-ranking officials from Hyundai Motor Group on the 25th, Hyundai and Kia Motors are going to apply ‘connected’ function to all of their new cars starting with new Veloster that will be released in next month. In the past, they had only applied basic connectivity function to their luxury cars through BlueLink (Hyundai Motor Company) and UVO (Kia Motors). Hyundai and Kia Motors started developing connected cars since last year. They are currently co-developing ‘automotive network technologies’, which are core technologies for connected cars’, with the world’s biggest network equipment and solution provider ‘CISCO’. 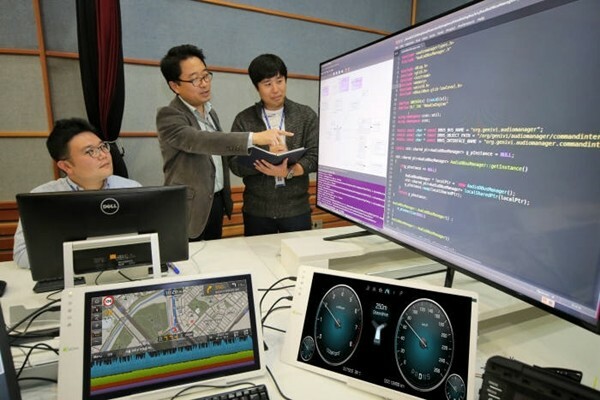 They are also developing an operating system (OS) for connected cars called ‘ccOS (Connected Car Operating System)’. They established a ‘strategic technology research institute’ in early this year and has strengthened its R&D on analysis of AI and Big Data. In September, they established the world’s first Big Data center in Guizhou, China. Hyundai and Kia Motors commercialized their connected cars by applying ‘Kakao I’, which is an AI platform co-developed with Kakao and is a server-type voice recognition technology, to Genesis G70 in early this year. G70 provides useful information on browsing of destinations, popular restaurants, tourist spots, and auto shops through ‘one shot’-type voice recognition technology. Hyundai Motor Company expanded lineup of its connected cars by applying Kakao I to 2018 ‘Maxcruz’ as well. Currently Hyundai Motor Company is also providing its connectivity service utilizing its voice recognition assistant in the U.S. In August of 2016, Genesis Motors applied Amazon’s voice recognition assistant called ‘Alexa’ to its G80 and G90 (name in South Korea: EQ900) which was the first time in the world. Hyundai Motor Company started a service that links Google’s AI voice recognition assistant ‘Google Assistant’ and telematics service called ‘BlueLink’. Hyundai and Kia Motors partnered up with ‘SoundHound’, which is a company in Silicon Valley, and developed an interactive ‘voice recognition assistant service (Intelligent Personal Agent)’ that utilizes voice recognition AI technologies. This service will be introduced through new 2019 cars. Based on an interactive AI platform called ‘Houndify’, this service is able to send and receive calls and texts, search point of interests and addresses, manage weather information and schedule, control air conditioner system, sunroof, and doors, and provide Car to Home service. It is heard that voice recognition assistants from Hyundai and Kia Motors have higher level of response than current voice recognition assistants on markets. Other voice recognition assistants that mostly operate at homes tend to have many malfunctions if they are to operate inside of cars where there is a high level of noise. However Hyundai and Kia Motors were able to develop voice recognition technology that can accurately understand and carry out a driver’s messages even in environments where there are much noise and vibration.